This is part two of a series exploring both the basics and finer details of bank investing from a value perspective. My first post in this series was very well received, so well received that it has become the second most read post I've done. In this post I want to explore the difference between a bank and a bank holding company, and why the distinction matters for investors. When most people think of a bank they think of a local institution that gathers deposits and makes loans against them. These banks are regulated by the FDIC, OCC, or state banking regulators. The job of the regulators is to ensure that banks don't take undue risk with their deposits which might jeopardize their capital. Bank holding companies are non-bank corporations that own one or more banks, and possibly other related bank or non-banking businesses. Bank holding companies are regulated by the Federal Reserve. The easiest way to tell the difference in the two is the name. A bank will usually have the word "bank" in the name, non-banks aren't allowed to call themselves banks. 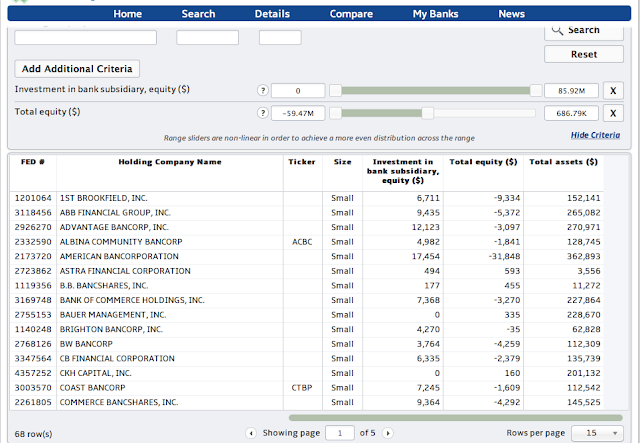 A holding company often has a name that's similar to "bank" such as "bancorp". Most depositors and borrowers deal with banks, whereas most investors deal with holding companies. The first question most readers are asking is "why does this exist?" That's a great question, and the answer is somewhat complicated. The biggest reason is that holding companies have a lot more flexibility with their operations compared to banks. The biggest reason holding companies exist is the ease of raising capital for a holding company. A bank is very restricted in how they can raise capital, it is usually limited to issuing equity. A holding company on the other hand isn't restricted and can raise funding via the debt markets, equity markets or through other creative financing creations such as the Trust Preferred Security. Let's take a very simple case, a bank needs to raise capital. If no holding company is present they have very few options, the easiest option is to dilute current shareholders and do an equity offering. Equity is the most expensive form of capital to raise, and something shareholders would prefer to avoid if possible. To continue the example consider a bank with a holding company. This bank decides to raise capital through the Trust Preferred structure. The bank creates a trust (a special purpose entity) which issues non-voting preferred shares to investors. Investors purchase the shares raising cash for the trust. The holding company then issues a subordinated note to the trust on the same terms as the preferred. At this point the holding company has the cash raised from investors on their balance sheet. To then get that cash to the bank they issue equity at the bank level. Investors in the holding company have not seen their stake diluted through the equity issuance. Holding companies also offer other advantages, such as fewer restrictions on purchasing shares, ease of purchasing other holding companies, and ease of purchasing other non-bank subsidiaries. The structure is so popular that 84% of commercial banks utilize the holding company structure. Often investors get banks and holding companies mixed up which can have dire consequences. A subsidiary bank could be very healthy, yet if the holding company is deeply indebted the company could be on the bring of collapse. The bank's balance sheet is very simple and clean. They have $265m in loans, $58m in cash and securities and $301m in liabilities, almost all deposits. Drilling down into the balance sheet shows that the $17m in "other borrowed" consists of FHLB advances. There are three fields I want to focus on, Other liabilities, Balances due to subsidiaries, and perpetual preferred stock. The holding company's other liabilities consist of a loan due to their ESOP. Balances due to subsidiaries are subordinated debt issued from a subsidiary, a Trust Preferred that I described above. The last item of note is the perpetual preferred stock. When these items are put together investors in the holding company only have $30m in equity capital. What we see when looking at First Menasha Bancshares is that while the subsidiary bank's capital structure is simple, the holding company's is a bit different. Investors in FMBJ (the stock) are buying shares in the holding company, which has $30m in equity, not $37m. Earnings are similar, the subsidiary bank earned $3.1m in 2012, but for investors in the holding company earnings were only $2.6m. There are 68 holding companies in the US where the underlying bank has positive equity capital, enough that regulators are satisfied, yet the holding company has negative equity. Simply looking at the underlying bank gives investors an incomplete picture. Unless an investor is looking directly at a bank they need to consider the bank's holding company as well. In most cases investors in publicly traded banking stocks are purchasing shares of a holding company, not an underlying bank, which makes the distinction all the more important. Thanks for the information. Your articles have truly helped a lot. What is the screener that you use? I'm glad you're finding the articles useful. The screener is part of a banking information tool I'm launching in the next few weeks. Great article! where did you learn all this? A lot of reading and experience with some helpful friends who guided me in the right direction. I would also love to hear your opinion or if you had experience in investing thrift conversions and de novos. You've touched on the balance sheet very well but my concern is the cash flow statement for banks. How do banks do their cash flow statements when they take in deposits and borrowings on a daily basis? Would this be considered operations?